I have listed a new property at 69 10221 WILSON AVE in Mission. I have listed a new property at 1910 SUFFOLK AVE in Port Coquitlam. Thanks you for all those who commented and liked The Thornton Group Real Estate ! 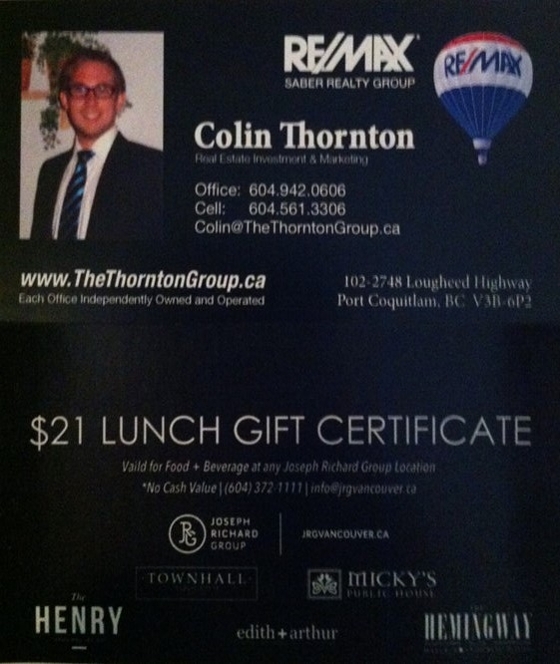 From either Facebook, Instagram or Twitter @RealEstateBcNow! All contributes names were put in a box and one was randomly selected ! CONGRATULATIONS Michelle Briann ! You have won Lunch at Micky's Irish Public House or any other Jospeh Richards pub location! Please private message me the address you would like your prize mailed/dropped of to ! I have listed a new property at 3 19171 MITCHELL RD in Pitt Meadows. RARE FIND. Don't miss this clean well maintained and SPACIOUS 2 bdrm, 2 bath ranch style home at Holly Lane. Nicely updated w/ fresh paint & nice new wide plank laminate flooring throughout except kit & bathrms. Nice big master bdrm w/ dblcloset & a 3 pce enste w/ an oversized shower. Nice bright 4 pce main bath w/ tub & shower. Big open LR & DR with gas F/P & slider to a large covered patio, plumbed for a gas BBQ. Fully fenced & secure backyard, ideal for your little dog. Big bright kitchen w/ lots of cupboards & counter space, large eating area & S/S appliances & gas range. Oversized single garage w/ room for additional storage. New hot water tank in 2013. The value of approved building permits for both Vancouver and B.C. was up significantly in April both from April 2012 and March 2013. As housing starts continue their ho-hum-but-steady pace through 2013, a surge in the number of building permits shows stronger numbers might be around the corner. The six-month trend for housing starts in Metro was nearly identical in May, at 16,324 units started, compared with April, at 16,370 units started, Canada Mortgage and Housing Corporation reported Monday. One of the PNE’s annual highlights is the favourite Summer Night Concert acts on the WestJet Concert Stage at the PNE Amphitheatre. Once again the PNE has something for everyone, not sure if the acts are a big enough draw to help the fairs struggling attendance. If you decide to rent your home, the decision will not be an easy one, especially if you have no experience in it. You may think that renting out means placing an ad in the local newspaper or listing your home on a website. However, there is more to renting than this. Here are some tips that will help you prepare when you decide to rent your home.